Illinois basketball’s bad season ended yesterday with a blowout loss to Purdue in the Big Ten tournament. 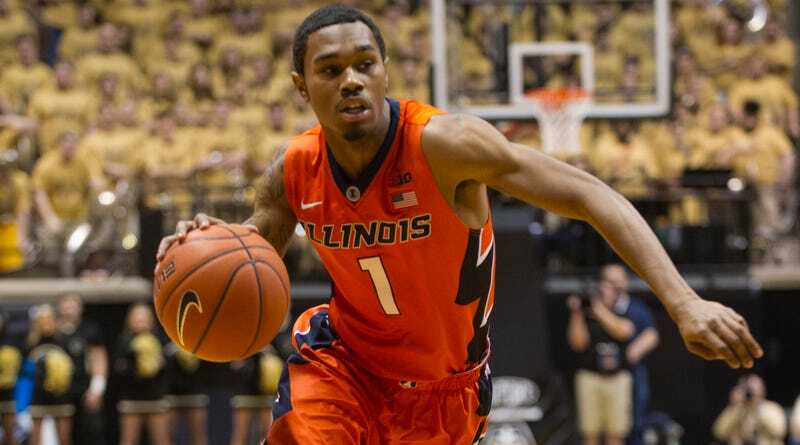 Shortly after the team returned to Champaign from Indianapolis, junior point guard Jaylon Tate was arrested for domestic battery and to the Champaign County Jail. Per court records, he was booked at around 6:15 this morning. Ramseyer said the officers could see she was spitting blood and had a swollen face. She went to Carle Hospital’s emergency room to be checked out, he said. Although not all of the police reports about the incident were complete Saturday morning, Ramseyer said officers talked with at least two of the woman’s friends, who said she told them she had been hit once or twice. We are aware of the allegations against men’s basketball student-athlete Jaylon Tate. Tate has been indefinitely suspended from all team activities pending legal proceedings and an investigation into the allegations. It is important that we take time to fully understand the events of (Friday) evening before passing judgement. We condemn domestic violence in all its forms and will move swiftly and decisively if these allegations are substantiated. Tate is the second Illinois basketball player arrested this year, and the third since August. If you have any information on the case, please drop us a line.